The most common reasons to invest in silver are to diversify your investment portfolio and to hedge against economic uncertainty. Many experts say that your investment portfolio should contain precious metals, and depending on whom you talk to and what your goals are, this can range from 1 percent to 20 percent of your portfolio. The reason that many planners recommend investment in metals like silver is that they can be much more stable than many other types of investments. Silver has an intrinsic value, and it has been used as a currency in the past. Unlike stocks, precious metals will not go out of business or fail due to improper management. As with gold, there are two main investments types that you can choose from: purchasing physical silver or investing in a financial security that is tied to the price of silver. 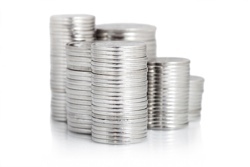 When purchasing physical silver, you can buy silver bars, silver bullions and silver coins. Bars and bullions derive their value from their silver content, but the price of coins tends to be based on both their silver content and collectibility. Some experts say that silver coins are fine so long as you understand the additional price fluctuations associated with them. On the other hand, many in the field say that it's best to stay away from coins for purposes of investment. These are available from banks and bullion dealers. Buying the largest bar possible can help to reduce the difference between the price of the bar and value of the bar since what you pay includes the cost of production, and larger bars cost less to make. Silver bars of five kilograms offer the best value, but they can be very expensive. Therefore, it may be a good idea to purchase a few one-kilogram bars to reduce the cost of your investment without sacrificing too much money on production costs. Along with purchasing physical silver, you have the ability to purchase exchange-traded funds, or EFTs. EFTs are stocks that are tied to the price of silver, and they are traded on both the London and New York Stock Exchanges. The advantage of these types of investments is that they are far more liquid that owning physical silver. It can also be cheaper to invest in silver via EFTs than purchasing bars or bullions since there are fewer associated fees. That said, there are some significant potential drawbacks. While some EFTs do provide you with paperwork that shows you have ownership of one ounce of silver for every share you buy, many EFTs are based on derivatives, so you may not actually be purchasing any silver. Further, even if you do invest in an EFT that is based on silver, it's difficult to redeem shares for physical silver. Additionally, shares can be sold short, so you may end up sharing ownership of the same silver with another investor. If you've decided to invest in precious metals, you may be wondering if you should invest in gold or silver. Due to silver's lower cost, many people use it as a way to acclimate to investing in precious metals and then move onto gold when they feel more familiar with the way this type of investing works. While investment options tend to be the same, gold generally carries a higher value, and its prices are more stable. Silver can almost always be purchased for less, and due to its value as both an investment and its use in production, prices tend to be more volatile. This makes it a better option for obtaining a return on investment, especially if there are large market corrections, but this type of investing can be fairly risky for those who are not experienced with the market. Silver is subject to taxation in both the United States and in Europe, but how it is taxed is different. In Europe, gold is not subject to value-added tax, or VAT, but silver is. The VAT rate depends on where someone is; the VAT in England is 20 percent, but it tends to be much lower throughout the rest of Europe. You may be able to avoid paying a VAT if you purchase silver bullion and store it in an accredited vault in an allocated account. However, if you take delivery on your silver bullion, you will definitely be required to pay a VAT. In the U.S., the system is more complex because silver is not taxed until it is sold. This is because its sale falls under the capital gains tax system. The maximum rate that you may be required to pay on collectibles is 28 percent, but how much you actually pay will depend on how long you owned the silver, your normal income tax rate and how much was made on the sale. Your tax rate will also depend on whether the sale is considered a short-term or long-term capital gain. One upshot of having silver sales taxed under the capital gains system is that you may be able to reduce your tax burden on other capital gains if you sell your silver at a loss. Along with keeping silver at your home and in banks, you also have the option of storing silver at precious metal depositories. Storing silver in your home means that it is available immediately, but you'll also need a secure place to store it, such as a safe, and a good safe can be an expensive investment. Additionally, you'll need to insure your silver to protect against loss due to theft or fire. Storing silver in a bank provides more protection, but it's difficult to get insurance for silver in a safe deposit box, and bank deposit boxes are not FDIC insured. Many people are choosing precious metal depositories to store their silver because they offer incredible security and the price of insurance is generally included in the cost of storage.